Was there a single jazz musician in the audience for the Kennedy Center Honors ceremony last month? 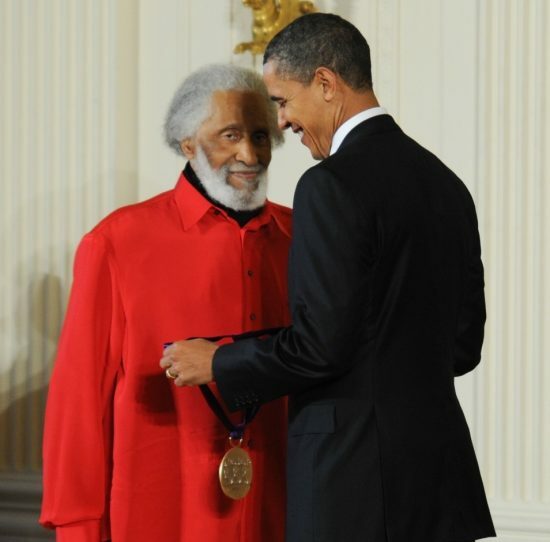 Besides Sonny Rollins, that is, who was one of the five honorees. From what I saw on the CBS telecast of the ceremony, the only jazz musicians in the house were those hired hands who were on stage playing in Sonny’s honor. Is it possible that no other jazz players were there? It’s more likely that the show’s producers wouldn’t recognize a jazz musician even at close range, so all we got were long shots of the Obamas and movie and pop stars. At least the President and First Lady looked like they’d heard jazz before they got to the Center, and surely they appreciated Bill Cosby’s irony-laced introduction. But how many people in that bejeweled crowd had ever heard a note by the Saxophone Colossus? Granted, it was great to see Sonny getting the honor, to watch the montage of images from his career and hear the narrative voiced by Cosby. Cos described his own surprise encounters with people in far flung places abroad who in the midst of their daily routines were listening to Rollins, then concluded his remarks by welcoming Sonny “home” to his native land. But notwithstanding the primacy of jazz in American performing arts, the music long ago lost its appeal for the masses, and even the curious may know little about its history and Newk’s place in it. Thus while Cosby’s comments spoke to his personal admiration for Rollins, the occasion called for something more, the kind of critically-grounded statement that a Stanley Crouch or Gary Giddins or Bob Blumenthal could have provided. But a teaching moment like this was squandered, while the most resonant image may have been the sign of Rikers Island displayed among Rollins’s personal landmarks. Rollins hasn’t necessarily shied away from discussing the problems he had with narcotics early in his career, and the narrative didn’t either. As Cosby said, Sonny knew “the dark side of the night life.” One wonders if it’s the night world in which jazz musicians work that arouses the suspicions and fears of everyday people, not to mention cultural institutions and philanthropies. This apparently forbidding world, combined with the highly complex and unpredictable nature of modern jazz, keeps even its greatest players from receiving wider exposure in the press, the kind that would make them recognizable to a director of a show like the Kennedy Center Honors. But I suspect there’s more to it. When I first expressed dismay over the absence of jazz musicians in the audience, folks thought I was saying the cameras didn’t pan to anyone black, but that’s not the case. It was jazz musicians, black or white, who weren’t shown. And the more I think about it, the more I’m convinced that it’s not the mythology of nightlife and drug use and young burnouts, nor the complexity of the music, that makes the cameras turn away. It’s the absence of jazz celebrities, and a substantial class of musicians who’ve become wealthy playing the music. Cameras will make a fuss and confer a modicum of respect on the most dissolute performing artists– as long as they’re rich. But jazz lacks for wealth, and that keeps the music out of view for nearly everyone but the diehard. Of course, the issue isn’t confined to who’s on camera. In the case of the Kennedy Center, it’s even more about the number of jazz musicians who’ve received the honor. Rollins was more than deserving, and has been for years, but so too are numerous other players who’ve been overlooked since the inception of the honor in 1979. So far, only nine jazz artists have been among its 170 recipients over 34 years, and given that the Center itself calls jazz “the truly American art form,” I’d say it’s time for an infusion of musical patriotism. Here’s a list of additional jazz greats, all past age 80, who’d do the honor, as they’ve done the art form, proud: Benny Golson, Chico Hamilton, Roy Haynes, Jimmy Heath, Lee Konitz, Yusef Lateef, Horace Silver, Clark Terry, Frank Wess, and Randy Weston. How about it? Alas, I’d say the prospects are dim. Even though the Center recently named Jason Moran as the successor to Billy Taylor as its Artistic Advisor for Jazz, only two jazz musicians, Rollins and Dave Brubeck, have been honored by the Kennedy in the past decade. And given the paucity of players and jazz experts on the Center’s Board of Trustees, which doubles as its nominating committee, some of the most deserving exemplars of what Dr. Taylor called America’s Classical Music may pass on before their number is called. That would be a disservice both to jazz and the nation. Tom Reney produces “Jazz à la Mode” and blogs at New England Public Radio www.nepr.net in Amherst, MA.